Many people love the wonderful things fresh garlic can do to enliven an otherwise unremarkable dish. Some like the flavor but fear the dreaded social curse of garlic breath. Others fear garlic may overpower an otherwise delicately flavored work of culinary art. Put your concerns to rest, epicures, there are ways to deal effectively with these and other aspects of natures best health food to add life to your creations by creating just the right amount of flavor. Conversely, we will also pass along ways to embolden ethnic dishes and others so as to enhance the depth and breadth of their central flavor, that of garlic. First, let's discuss a few ways to bring about just the right touch you're looking for, whether it's subtlety or a brazen blast of garlic flavor. If you have read our sections on an Overview of Garlic and Varieties of Garlic, then you know there are mild garlics, such as Simoneti and Burgundy and medium flavored ones like inchelium Red and Locati as well as strong garlics, like Metechi and Chinese Purple. It naturally follows that to get a faint hint of garlic flavor, you can use a mild variety and a stronger one for bolder taste. The first secret is to start with the right garlic, but there is more to it than that. 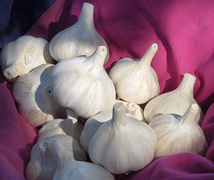 Several other factors influence how much flavor is imparted to a dish by the garlic. You can actually make a mild garlic seem much more potent and a powerful garlic seem meek, just by knowing how to prepare the garlic and when to add it to the food you are preparing. A properly cured, healthy garlic bulb has neither smell nor taste, nor does a carefully removed clove from the bulb. You can gently peel the clove cover away from a clove and it still has no taste or smell, unless you damage it in some way during the separating or peeling process. The reason for this is the components of garlic that cause its smell and taste are kept apart by the internal and external cellular walls. When garlics cellular walls are broken by damaging the clove, the alliin and allinase that are stored apart from each other in the clove mix together and form the allicin, which is what causes garlic to smell and taste as it does. Allicin is a volatile substance that will break down on its own in a few hours and form several different sulphuric compounds. Heating allicin will cause it to break down much faster. The more allicin breaks down, the less of the smell and taste are present. Therein lies the second of the secrets to using garlic. Peeling individual cloves can be tedious, especially if the clove covers are tight. There's an easy way - just soak the cloves to be peeled in plain water for an hour or two beforehand and those clove covers will zip right off easily and without damaging the clove. If you don't have an extra hour or two, the e-z-rol garlic peeler by elan is an excellent product. It is fast and odorless, indicating it does not harm the clove. It looks like a large piece of pasta and you just put one or more cloves in there, roll it against a hard surface and the clove covers split right open. If you wish a more subtle garlic presence in your preparation, either put the cloves in whole or cut them into thick slices and cook them longer. You can put a big handful of whole garlic cloves in a small pot of soup and hardly even know there's any garlic in it. The more you cut the garlic, the more of the allicin is formed and the stronger the flavor. If you cut a clove into 8 slices, it will have more flavor than if you cut it into only 4 slices. If you dice the clove into many small cubes, it will release even more flavor and if you crush it, you will release the most flavor. If you want to bring out the full flavor of crushed garlic, let it set a few minutes to steep before adding it to your dish at the end of its cooking time. To remove garlic odor from the hands, just rub the hands with a piece of stainless steel flatware under running water and most of the smell magically goes away. Timing is important. When you put the garlic into the food you are cooking makes a huge difference in its eventual taste. The longer you cook the garlic, the less it will taste and smell and the more creamy and subtle its flavor becomes. If you want just a hint of garlic essence, use a mild variety of garlic in either whole cloves or thick slices and put them in early in the cooking processIf you use crushed garlic, there is more allicin to dissipate, but the result will be a richer, creamier garlic taste. Even a large, powerful garlic can be tamed by cooking it for longer than you otherwise would. If you want your creation to be bold, powerful and fairly reek of garlic, crush the cloves and put them in just before the cooking is complete and you are almost ready to remove it from the fire. Even a mild garlic will seem more potent when used this way. If you wish to eat a lot of garlic for its health benefits without being overpowered by it, you can put a whole bulb or more in a soup or stew of your choosing and get almost all of those benefits, and plenty of them, and still have a mild tasting dish. All you have to do is peel all of the cloves and slice them and put the slices into the soup at the beginning of cooking. You'll be pleasantly surprised at how mild 25 or 30 cloves of garlic can be when prepared this way. You almost can't taste them but your body will still get the healthful benefits from the garlic. You can also add them in this way to rice, beans, pasta sauces, scalloped potatoes or almost any dish you like. If you eat any fried or fatty foods or meats, you owe it to yourself to have garlic in some form with that meal to help counteract the elevated cholesterol that can otherwise come from such a meal. I remember seeing a study done at a clinic where a large number of people were fed a fatty meal, all getting the same sized portions, but some contained garlic and some did not. Those who had garlic in their meal had normal cholesterol readings after the meal. Those who did not get garlic had elevated cholesterol readings. Think about it. Whole cloves of garlic that have been cooked until they are mushy have no discernable health benefits as the cooking process destroys the enzyme, alliinase, before it can form allicin. The only exceptions are where the cloves are not yet cooked all the way through, that is if there is still a firm inner core that has crispness and pungency, or hotness. If you want health benefits, don't cook the whole cloves until they are mushy, leave some firmer inner cores and you will not only get some health benefits, but a surprisingly delicious eating experience as the heat takes a lot of the edge off the garlic and smoothes out the taste a lot while at the same time giving you something that is delightfully crunchy and warm in the center of the sweet mushy garlic clove. Garlic isn't just garlic; there are hundreds of cultivars of the ten basic varieties of garlic and they all have their differences in tastes, flavors, aftertastes and health benefits. The consensus of informed opinion is that the hotter the garlic when raw, the more allicin that can form and thus the greater health benefits. Many different kinds of compounds form, depending on how garlic is prepared and they are very different in nature and how they affect the body. Garlic has anti-oxidant properties and is an excellent source of selenium. First, let's take a look at a simplistic overview of how non-irradiated garlic works so we can understand what we're dealing with. A bulb of garlic, Allium Sativum L., has from four to 16 or more cloves, depending on variety. In each of these cloves are cells containing the main compound of garlic, an amino acid called Alliin. In separate cells an enzyme called alliinase resides. Whenever the cellular walls separating them are damaged, some of the enzyme comes into contact with the amino acid and this sets off a chemical reaction that causes sulfenic acid to form instantly. But sulfenic acid is unstable and reacts with itself and breaks down at a steady rate into another unstable compound called allicin, which has a strong antibiotic property. Allicin is the "magic bullet" in garlic from which its many benefits are derived but being unstable, it reacts with many things, including itself and breaks down into other compounds. Because garlic forms the active compound, allicin, steadily and in regular spurts rather than all at once it is better to let it set for a 15 to 90 minutes before using it in order to build up a greater amount of allicin. Allicin has a half-life in air of about 18 hours as it slowly deteriorates into other smelly, sulfurous things. Adding allicin to water somewhat stabilizes it and preserves its antibiotic properties and extends its half life to about two months. Allicin from crushed raw garlic is a very strong antibiotic that kills all bacteria, including MRSA staph on contact and staph cannot become immune to it because it kills bacteria by causing their cells to swell and burst rather than blocking chemical receptors like pharmaceutical antibiotics do. Numerous studies have shown that allicin is too volatile to exist long enough (half-life of less than one minute in blood) in the human body to do much good so it is the breakdown metabolites we are interested in. When you cook or otherwise heat garlic that has been crushed the allicin that has formed breaks down into some unstable smelly fat-soluble polysulfide compounds that include Di Allyl Tri- Sulfide (DATS for short) which has strong antibiotic and anticancer properties breaks down into the much more stable Di Allyl Di-Sulfide (DADS for short), which lasts longer but has only about a tenth the activity of DATS. When you mix crushed raw garlic with alcohol or vinegar, water-soluble polyvinyl compounds are generated. When you eat these things, the water-soluble compounds are tiny and some of it passes right through the walls of the stomach are are absorbed directly through the capillaries into the blood stream; the fat-soluble polysulfides are too large to pass through the openings in the capillary walls and so move to the bottom of the stomach where they pass out through the pylorus into the duodenum where they are readily absorbed into the lymphatic system, a fat-soluble environment. They circulate around the lymphatic system for a few hours and then are dumped into the largest vein, the vena cava and circulate in the venous system. While these garlic metabolites are in the lymphatic system they kill or inhibit cancer cells and strengthen the immune system. Once they get into the blood stream they go through the liver where good things are extracted and bad things flushed out through the bile duct to be excreted and also force it to manufacture more HDL cholesterol which then reduces the amount of LDL cholesterol and reduces total cholesterol and reduces tri-glycerides. The remaining garlic metabolites also work their way through the lungs and that is when they cause secondary garlic breath and also a garlicky smell emanates from the sweat glands and pores. This is an unavoidable consequence of consuming garlic and is your way of knowing the fat-soluble garlic is circulating in your lymphatic system and the rest of the body, too. Good garlic pills with abundant fat-soluble compounds will produce such a garlicky aroma several hours later; the less the secondary odor, the less the fat-soluble garlic compounds assimilated and those are the compounds that strengthen the immune system and protect against infection and cancer. The fat-soluble compounds have certain properties and the water-solubles have different properties. The water-solubles are odorless while the fat-solubles are very odorous, thanks to a compound called allyl mercaptan, which causes the garlicky odor. The odor-free main water-soluble compound is S Allyl Cysteine, SAC for short, while the main fat-solubles are the polysulfides like Di-allyl tri-sulfide (DATS) that break down into their most stable form, the smelly Di-Allyl Di-Sulfide, DADS for short. DADS is somewhat antibiotic but much less so than DATS, has anti-tumor properties and strengthens the immune system by stimulating it to build antibodies. The odor-free water-soluble SAC is great for those in socially sensitive situations who still want the circulatory benefits of garlic but who really don't want the odor of the fat-solubles. In standard dosages SAC has almost no antibiotic or antitumor properties but has excellent circulatory system benefits including lowering blood pressure, blood sugar, triglycerides and total cholesterol and inhibits clotting, preventing strokes and heart attacks. Garlic pickled in vinegar or wine and garlicky salad dressings are sources of SAC. The fat-soluble DADS is a strong immune system ally in the fight against cancer and also has very strong circulatory system benefits. In 1996 Penn State reported that Kazuko Sakamoto, a researcher in their College of Health and Human Development had discovered that DATS and DADS were shown to have success in inhibiting skin, breast and lung cancer cell lines with DATS ten times more effective than DADS. That's very important because the DATS and DADS from crushed cooked garlic circulate in the lymphatic system where they inhibit cancer cells spreading there. In addition, the Disulfide in DADS is used by the immune system to manufacture antibodies, which are held together by a disulfide chemical bond, further strengthening the immune system. Except for salads and condiments, we will be dealing with the fat-solubles, DATS and DADS. If you crush garlic and let it set in air (steep) for 60 to 90 minutes before using, it will have more healthy compounds than if you use it immediately after crushing it. If you fry fully steeped crushed raw garlic in oil over medium heat (Do not cook beyond the golden color and remove the fried garlic pieces from the oil or it will become bitter. ), that oil takes on very substantial amounts of DATS, DADS, both known to have antitumor properties and Ajoene, a substance currently being investigated for anticancer potential. Anything fried in that garlic-laced oil will pick up the immune system enhancing fat soluble compounds and be healthier to eat than if the oil did not have the polysulfide compounds. Use it in vinegar and oil salad dressing to increase the health benefits in vinegar and oil dressings. The more of the garlic's cells that are damaged, the more allicin can be created so crushing releases more potential than slicing or coarse chopping. To do this it is best to have a garlic crusher that has enough capacity to crush larger cloves and mash them through a screen and is easy to clean and made of stainless steel (see illustration below). I, personally don't have a problem with garlic breath. It's not that I don't get garlic breath, it's that I don't care if I do have it. My wife is very understanding about this as she doesn't care whether she has garlic breath, either and we both recognize it as a symptom of good health and if we both have it, neither of us can tell that the other has it. Clearly, I have married the right woman. After all, garlic lovers reek of good health and garlic gives the breath of life. We believe that garlic breath is much better than no breath, but for those who are more concerned about offending others olfactory organs than we are and who wish to reduce emissions to a more socially acceptable level, there is an old trick you can use. Sunflower seed oil and parsley taken together will drastically reduce or even eliminate primary garlic breath. After eating a garlicky meal, eat a spoonful of sunflower seeds and a sprig of fresh parsley and you will find your breath much less offensive to others. There is even a commercial product on the market touting this and guaranteeing it will work. I do not know what effect sunflower seed oil and parsley have on the physiological effects of garlic as I have seen no research on it. There's two kinds of garlic breath; primary garlic breath which you get immediately after eating garlic, caused by traces of garlic in your mouth and throat and then there's secondary garlic breath you get later as the garlic works its way through your circulatory system and expelled through the lungs. If you have eaten enough garlic, you can even find your perspiration smells like garlic and that is your way of knowing that the garlic is working its way through your system and making you healthier. If it bothers you, shower often and use a baking soda deodorant. A little odor is a small price to pay for good health. Also, these days, with garlic being so popular, you will have plenty of company and people will just think you have good sense and are stylish. Who knows? It might even help you get dates. For centuries garlic has had a reputation as an aphrodesiac and an energy booster - the Roman legions ate copious quantities of it. I have read a research report that said garlic is a mood enhancer and that it gives its consumer an elevated sense of well being - and it's legal, too. Let's be honest, here. If you eat the wide selection of garlics we talk about on this website, You'll be proud of your breath! You'll have highly desireable, expensive, designer breath. You'll have Red Toch breath or Russian Redstreak breath or Rose du Var or Burgundy breath, or Spanish Roja or Persian Star breath. Anyone can have garlic breath, but it takes someone special to have Gourmet Garlic designer breath. Let the peasants who eat common grocery store garlic worry about their breath, Your Gourmet Garlic designer breath will be the envy of all your friends. Clearly, one must be careful not to become a perfect snob about this, but it's so easy to succumb. It is rapidly becoming good health practice to rub all meats with crushed raw garlic before cooking, especially ground meat. We have all read about outbreaks of E. coli as a result of meat handling practices of processors and others who handle meat in the supermarket and other places. Crushed raw garlic is a powerful antibiotic that can kill E. coli, strep and staph germs and many other bacteria. Crushed raw garlic applied to the outer surfaces of meat can kill those germs on the outside of meats, although it may not kill the germs on the inside of ground meat since it does not come into contact with them. Thorough cooking will kill them, but if you like your steak or burger patty a bit on the rare side, be generous with the garlic as a precautionary measure. Even little slices of raw garlic to chew with the meal can help kill food-borne bacteria and save you much discomfort later. All that power and it tastes great, too. Of course you will smell like you really enjoyed your meal, but you won't care much, you'll be enjoying that enhanced feeling of well being that garlic gives. Ever wonder why having garlic breath never seems to bother those who have it? A little garlic breath is better than no breath and a lot more fun. The anti-bacterial properties of raw garlic rapidly diminish with cooking, as the allicin, which is the active ingredient that kills the germs is destroyed by cooking. It breaks down into other sulphurous compounds, which are still fairly effective as a germicidal agent, according to studies. Many people experience stomach or intestinal distress after eating raw garlic. Not being a doctor, I'm not sure why this happens. It could be an allergy to one or more of the sulphides in garlic. Much of it probably is a reaction to the sulfenic and sulfonic acids that immediately form in freshly crushed garlic and then break down into allicin, which then breaks down into sulfides and things. The acid might be irritating some tender or inflamed tissue. Of course, there could be other reasons. They might try cooking the garlic until it just loses its crispness and see if that doesn't feel better to eat. If they continue to experience difficulty should see a doctor about it before eating a lot of garlic. Doctors have recently discovered that many ulcers are caused by bacteria, called Helicobacter pylori, that can reside in peoples digestive systems. Some recent tests have shown that garlic can help to kill the bacteria involved and help to alleviate their symptoms. Who knows? It might be that in time, the more garlic they eat, the less the discomfort will be. People with this problem should see their doctors and surf the web to find out all they can about what modern researchers are saying about ulcers. Just a thought. We're not going to publish a lot of recipes because you could do a quick search of the web and get more than you could possibly try in a lifetime. But we do want to publish a few that we think you will enjoy. The main thing is to be creative and see things in a new light and do things a little differently; after all, by deciding to enjoy garlic, you have made the decision to live a new lifestyle and be a new person you haven't been before, get used to the new aura of living in an enhanced state of well being - and feel good about it. 2 medium to large potatoes, peeled and diced into half-inch cubes. 1 carrot, cut into eighth-inch thick slices. 1 celery stalk (inner ones are milder-outer ones stronger) cut into eighth-inch slices. 1 bulb of garlic cloves, peeled. 1 and one-half cups of milk. 1 sprig of parsley, chopped. Place potatoes, carrots, celery, garlic cloves and water into a medium size saucepan, cover and heat to boil and boil for ten minutes. Add milk, butter, parsley, salt and pepper, then cover and bring back to boil, then reduce heat and simmer until the potatoes reach the state of tenderness you prefer. By that time the garlic will be completely cooked and will add a mild and creamy, even subtle garlic flavor. Serve with crackers or crusty bread. Be bold, experiment - try slicing the cloves and seeing what difference it makes to the taste, then try crushing one or more cloves. Try putting in the garlic later and cooking it less to see the changes in the taste that cooking time makes. In the springtime, try this recipe with a bunch of fresh green garlics (they're kinda like green onions, but with a difference) or garlic scapes (the delicately flavored stalks that are cut in the late spring/early summer) instead of a bulb. For a special treat, try ladling the soup into thick bowls with handles and place two long slices of Swiss cheese criss-cross over the soup and heat in a moderate oven until the cheese is melted. Remove and let cool before serving as soup and bowl both will be extremely hot. One or more large bulbs of garlic. Olive oil or the oil of your choice, or butter. One sprig of fresh parsley, chopped. Other chopped fresh herbs of your preference-oregano, thyme, cilantro, rosemary, etc. Garlic baker, covered casserole dish or just some heavy duty aluminum foil if you're camping. Use Simoneti garlic if you want to use extra mild garlic or Inchelium Red for a medium flavor or Metechi for a more potent garlic. Chesnok Red (AKA Shivlisi) roasted by Tony Lia at the Garlic is Life Symposium and Festival in Tulsa is hands down the best baking/roasting garlic I have ever eaten - it had a delicious, sweet taste. Peel away most of the outer bulb wrappers, down until there are only 2 or 3 remaining around the bulb. Slice off just enough of the top of the bulb to expose a good cross-section of the cloves, about one-fourth inch (6mm) or so. Place the bulbs, cut side up, in your baking dish and drizzle enough oil all over them and let sink into the open areas of the bolb. You really need just enough oil to flavor the garlic and keep it from being singed, but you may use more if you want. Sprinkle the cut parsley on all the bulbs and then sprinkle a different herb on each garlic bulb to give each one its own personality and you a nice taste test. ADD A TABLESPOON OF WATER TO THE ALUMINUM FOIL OR BAKING PAN TO RETAIN ENOUGH MOISTURE TO KEEP THE BULB WRAPPERS FROM BEING SINGED. Then, cover the dish and place it in the middle of your pre-heated oven. Bake for 30 minutes, then remove lid (or, loosen the foil a little to let the steam escape if you're camping) and roast an additional 5 to 10 minutes for crisp,full flavored hot, hot garlic, 10 to 20 minutes for a nice zesty medium flavor with a little crunch left and up to 20 to 45 minutes more for mild, spreadable garlic that can be squeezed on a snack cracker or crusty bread. The longer you bake them, the milder the flavor will be and the softer the cloves will be. Not everyone likes their roasted garlic the same way, and who says they all have to come out at the same time? When they're done enough for some, simply remove them and let the rest roast a little longer until they attain the level of doneness preferred. Let all roasted garlic cool for a while before eating, as it will be very hot. Bet you didn't make enough. Be bold, experiment. Try roasting for a longer time at a lower temperature or for a shorter time at a higher temperature and see the differences for yourself. Try it with different oils and herbs. We have seen many different temperatures and cooking times called for in different recipes for roasted garlic and have tried to give you a good idea of what to expect. Ajo (pronounced AH-HOE) is the Spanish word for garlic and nothing jazzes up nachos better than adding some raw garlic to this great snack food. 1 medium to large bulb of garlic, peeled and cut into 1/8" to 1/16" thin slices and let set 10 minutes to steep before toasting. 1/2 cup Monterray Jack cheese, grated. 1 bag of restaurant style corn tortilla chips or nacho chips (please, not flavored). Place layer of chips to cover bottom of cookie sheet, pizza pan or, if you don't want to clean up, just a sheet of aluminum foil. Sprinkle the cheeses thinly to cover the chips (you can mix the cheeses or put a different cheese on each side) and then sprinkle on the garlic slices. Next toast the mixture in a pre-warmed 400 degree oven until the cheese melts and begins to turn slightly brown - it only takes 3 to 5 minutes. Remove from oven, let cool a little (WARNING! - MELTED CHEESE CAN BE HOT ENOUGH TO BURN YOU! - BE CAREFUL) before serving. Serves 2 to 4 or just me during the first half of a playoff game. Be sure to have a larger amount of ingredients on hand because these things are so addictive we usually eat the first batch while making the second, larger batch. They really provide a good feeling of enhanced well being that is almost a high. Flavor can be adjusted by varying the kinds of cheeses used, the thickness of the garlic slices and the length of time toasting as well as the variety of garlic used, which makes a difference. I like to use a mixture of cheeses for their variations in taste/texture as well as using different garlics for their flavor differences. How long you expose it to heat dictates how potent the garlic flavor will be. Thinner garlic slices cook more completely than thicker ones and are milder in flavor; thicker slices will be more pungent - I like them with the outer part of the slices soft but the inner cores still firm as it adds a nice warm flavorful crunch. You can even add sweet peppers or hot chiles and mushrooms or crumble some pre-fried bacon, sausage or hamburger and flake a few herbs over it - be bold, experiment. You can make them like miniature Mexican garlic-powered pizzas. Try topping them with your favorite salsa. For health, lactose intolerance, etc, use a soy-based cheese substitutes, broccoli, califlower florets and tofu for a delicious, healthy alternative to cheeses and meats. One or more large bulbs of garlic, peeled and slivered lengthwise. 24 large fresh green Jalapeno chiles. 4 ounces of cream cheese, or soy cheese substitute or tofu. Serves 4 happy diners. Slice jalapenos lengthways and scoop out interior seeds and membranes and fill with as much cheese (or tofu) and a few slivers of garlic as they will hold. Place halves back together again and wrap with a piece of bacon and secure with a wooden toothpick. Grill on an outdoor charcoal grill, turning as needed to evenly cook. Takes about 20 minutes to cook over a medium fire. They're done when the bacon is completely cooked and the peppers are soft. Believe it or not, these things are not hot if cooked long enough as the heat destroys most of the peppers hotness and what remains is a pleasant spiciness. These things are even better if you cook them out with my friend, Bo Blair on the shore of Lake Brownwood playing some guitar and a little American Indian flute music on a quiet Sunday morning with each of us worshiping the creator in our own way as we play. I've seen many recipes for garlic ice cream using anything from garlic powder or chopped or crushed garlic and either cooked or raw, all resulting in different taste sensations, some very garlicky. Roasted garlic ice cream is in a class by itself, even among other garlic ice creams because it has a totally unexpected sweet, toffee or butter brickle-like taste and texture and with little or no garlicky flavor. It surprises people that they're really eating garlic ice cream. To me, the choice of ice cream is important not only for flavor, but it needs to be partially thawed to add the roasted garlic and then quickly re-frozen to harden before serving. The soft custard style ice cream works well for this purpose since it is already at the right consistency. I prefer to use the frozen custard from the old-fashioned DQ in San Saba, TX, a little town south of us, as they still serve the original recipe that seems to be so hard to find anymore. It's a 45 minute drive via back roads, but it's worth it. PREPARATION: Squeeze garlic from all cloves and mince if necessary and fold into the mushy ice cream so that the garlic is evenly distributed, freeze and serve hard.